So is the lesson that if you don’t want to be arrested for assault you should go to Khan’s? Maybe. Anyway, go to H. St, pick up a bowl, fill it up, and take it to the grill. Oh, and follow Khan’s on Twitter. 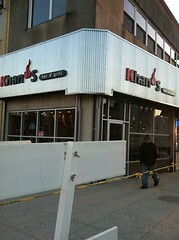 Khan’s Bar & Grill is located at 1125 H St NE. For more information, call 202-399-6010. Mongolian BBQ is neither Mongolian, nor barbecue. Discuss.